Gifts For Teachers – Do or Don’t? I’ve missed the Scottish school holiday time, but there’s always those of you in England who will be looking for some gift ideas for your teachers. I think there are probably a lot of things that we can and can’t give to teachers to just say a little thanks for all they’ve done all year for our kiddies. I’m not the best one at remembering to buy a gift for a teacher, but there seems to be a huge competition in some places over who can give the biggest, best, or most expensive gift. We’ve even had requests on occasion for a £5 per child to go to a gift and in principle I don’t have a problem with that, but I do have a problem with the kids who’s parents can’t or won’t add to the kitty being left off the card and the gifts being sent. When I have contributed to these things in the past, I believed it was for the teacher, not as some kind of mythical brownie point for parents who do contribute, so I pulled out of them a few years ago. I asked a couple of times for the card to be from all the children, and not just those of us who’d contributed and met a deafeningly silent stony wall. From that point I just gave up with it. I think collections do have their place, but only if all the children are treated equally. I have the kind of children who really struggle to get on with their teachers, so buying them a gift seems terribly uncool to them, but I have bought little trinkets in the past for them to hand over. Whether they are appreciated or not I have no idea, but it means more to my kids to choose something little. 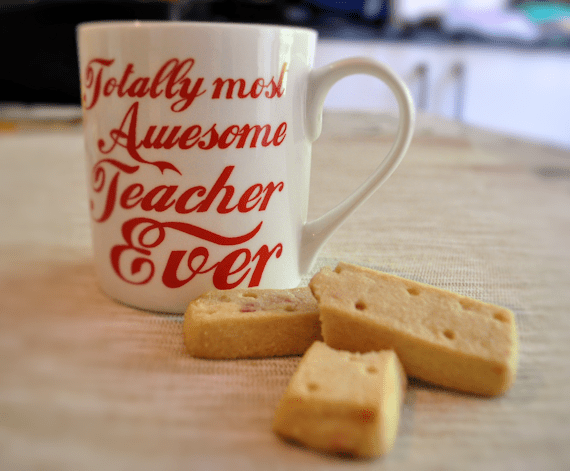 I got to thinking about teachers gifts due to a couple of things in the post which although weren’t really intended as gifts, they’ve ended up being little gems I can squirrel away for Christmas time. Sally from mrsmuggs.com asked if I’d like to receive a personalised mug. I didn’t know what I was getting, and she sent out a lovely one from her teachers gifts range. I actually would probably not buy a teachers mug, but I am very tempted to buy some of the ones from the other ranges. 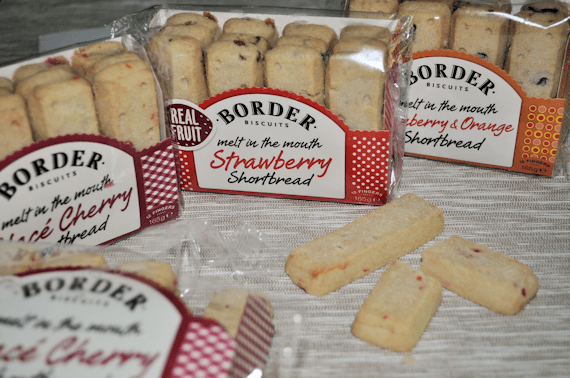 I wasn’t expecting a box from Border Biscuits, but as I’ve done some review work for them before, they must have decided to send me a box of their new shortbreads to try. We got strawberry, glace cherry and cranberry & orange. I’ve only tried the glace cherry so far but I’m sure the kids will devour some quickly enough. If I’d had these biscuits a few weeks ago, I suspect I’d have wrapped up a packet or two to give to teachers from middler as he seems to get on with his teachers better than my other two. It’s quite a hard call to make. What on earth do we give to teachers really though? They can’t take money, and we’re not allowed to take in home baking up here, so there really is only little trinkets or things that the kids have made themselves. I know that few parents would agree to crediting all children when only some of their parents contributed to a communal gift, so if we’re not money or kudos driven, what else can we give? I’m not into expensive gifts so it has to be little things that just show some appreciation and nothing more. I’ve heard of parents spending £20 on a present which I think is ridiculous, so for me, it’s all about the thought and not the price. Teachers are a sentimental lot. I think it has something to do with their noble undertaking of molding children at their early growing-up stages and while most teachers wouldn’t be caught dead waiting for rewards, I’ll bet they’d be thrilled to get a coffee mug or a box of cookies that simply says thank you. Besides did you ever have to spend 4 hours in a classroom filled with some twenty 5-8 year olds shouting and running after each other? We got a plant pot, plant and wrote on it “thank you for helping me grow” as well as a poem and chocolates. She seemed to like it.. I guess it’s all each to their own… I do feel that those who give a card with a message in it is just as thoughtful. It’s great if your children have really bonded with a teacher. In 7 years of school, my littlest has probably only liked two teachers and my eldest only 1. The middle one likes and dislikes everyone equally so he’s easy. I think this is a really interesting question. My wee lad is just going into primary 3 and this year he was really keen to give his primary 2 teacher something to show her that he appreciated her. We chose a nice card and a treat size box of chocolates (£1.35), which I thought was more than enough. When he came home, he said there were loads of kids with gifts and some were enormous. I have no idea what they were as the teacher in question just said thank you and put them to the side, but frankly, I do think it’s a bit weird to be giving huge gifts to someone for simply doing their job well! I’m a secondary school teacher, and thankfully there isn’t much of that sort of thing that goes on – I would be hugely embarrassed! The huge gift competition just makes me switch off. I don’t see the point. Nobody else gets lots of gifts at the end of every working year, so it amazes me how many teachers get them. I am really on the fence with this one. I’ve never agreed with it, they get a wage to supply a service, why should I give a gift? That’s partly my point too. Who else gets gifts for doing their job, but saying that, I wouldn’t like to have to teach a class of sometimes 30+ kids all day every day. There are much easier careers out there.